I had no idea it’s been almost over a month since my last post. Every day, almost, without fail I’ve been entering this space and putting my creativity and my worry to constructive use. When I took this picture on Sunday and took a second look, I realized that my dreams of a cottage garden are well under way. This is in north Regina. It looks like its somewhere in the country. Mission accomplished. The seeds that I got from my friend state-side stayed in the garage until this past week-end, when I took a look at what I had, thought long and hard about the current growing season as it stands, and asked myself if okra really has a chance in Saskatchewan. 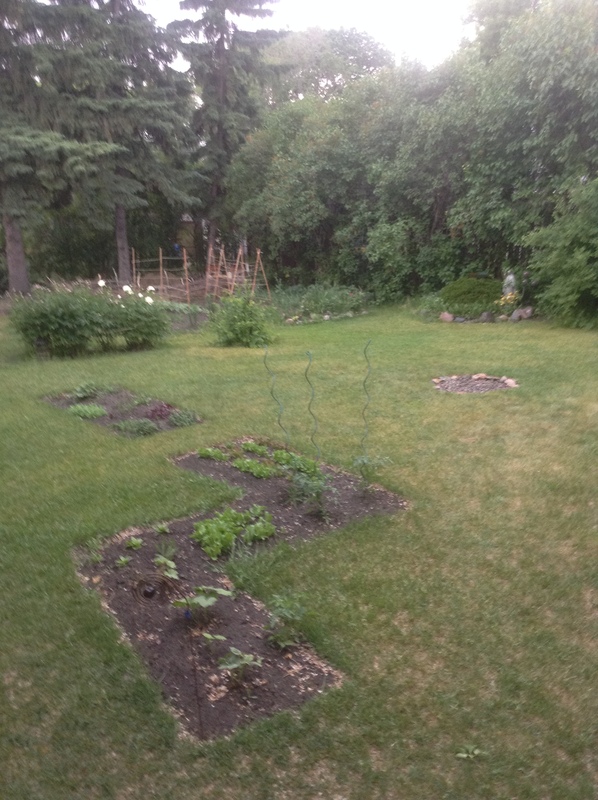 I planted it, along with some mustard greens, in between the two rows of carrots. I’m encouraged by other gardeners who’ve shared with me the carrots have either come up sporadically or not at all. I watered last night (the fiasco of water rationing here is for another post, and probably another blog, suffice it to say politics and water treatment do not mix) for a good two hours; when I came this afternoon, the middle of the garden was dry as a bone down to the middle knuckle on my middle finger. This is thirsty soil. The peonies and the irises did not disappoint. The peonies are a really rich vanilla cream in the middle of almost pure white petals, it looks like a bowl that you could sink your teeth into and smells, unlike the peonies I brought from the old place, wonderful…almost like cinnamon. Where I was sure the irises would be blue, or dark purple, I was surprised to see purple mottle with bright sun kissed yellow. I’ve only seen this in the neighbourhood in one other location. I pulled my first radish today, brought it home to my father like a prize. He was actually excited to see it. That just about made me cry. Seeded more radishes on the south side of the beans because in just a few days, I’m going to be able to pull and eat most of what’s growing. Monty Don wasn’t kidding when he said you can grow two to three crops of radishes in a season. 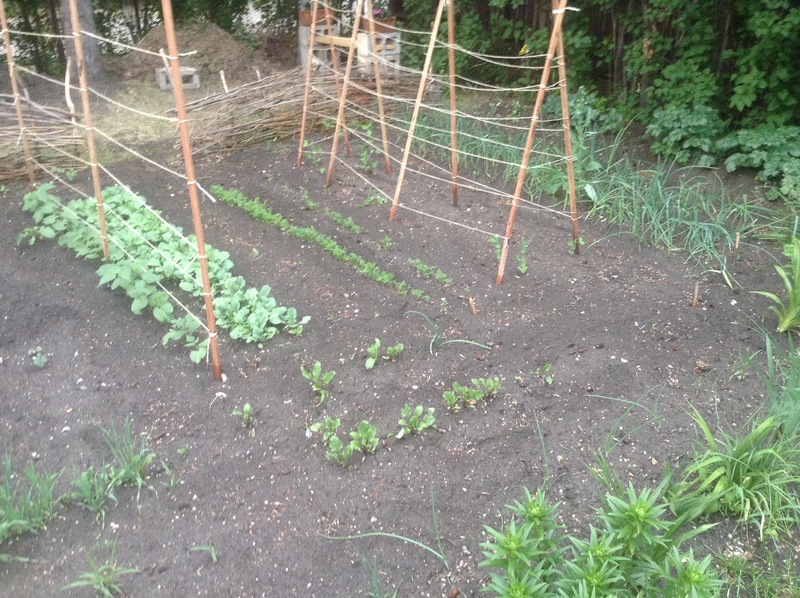 Peas came up sporadically so I planted the rest of the packet in amongst the cedar poles I bought. I had put in sticks, just long twisted branches from the cedar that was pruned down out front, but I realized they looked unsightly, like great dead fingers reaching out of the soil, and the string that I had tied around them for supports couldn’t get tight so they all hung down sad, droopy. The cedar poles are attractive, and cedar is naturally resistant to water so they should last me a few years. 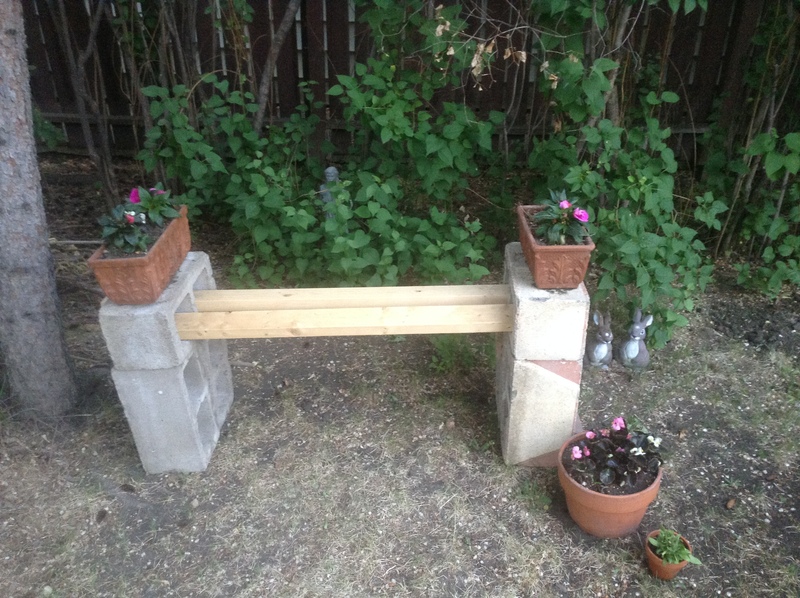 So I saw this bench idea on Pinterest, and since there’s plenty of cinder-crete blocks around I was able to toss six together with two pieces of wood from the renovation. It’s actually pretty comfortable! I’m slowly bringing my house plants from home and will be lining the waddle fencing on the “hidey hole” side (what I call my little sitting are). It’s big enough for one, or two if you’re not afraid to cuddle. I put a statue of St. Francis in behind it in the yearling lilacs and you can’t see it until you’re literally on the bench. It’s a secret that helps to bring me down when it comes into view. I do a lot of thinking and praying on this bench. Needs some paint but otherwise I’m really happy with the repurpose look. I’m not so sure that the house will be ready now until the fall. But I’m certain that every day lily that I add into the border, the garden grows and becomes more cottage like. The one flowering almond that sat mid-veg garden was half diseased so I ended up cutting most of the adult growth back almost right to the ground. New growth is springing up from the base of the trunks since the spring, but something tells me there may be a pond in it’s place before August. I’m budgeting at least $350 for the liner and the plants that I’ll need to create the natural pond I’m wanting to make. Friend of mine with a farm, Susan, has told me that yes she does in fact have rock piles I can come and take from, and lots of cow manure I can take as well. It isn’t so much pride that I’m taking in this space, although the process that it is becoming does fill me with a real sense of accomplishment that is becoming, developing, growing and almost mystical way. This is a prayerful place for me. I’m not sure if it’s that way for anyone else who visits, but I’ve heard at least one visitor say that it feels good to be in the garden.